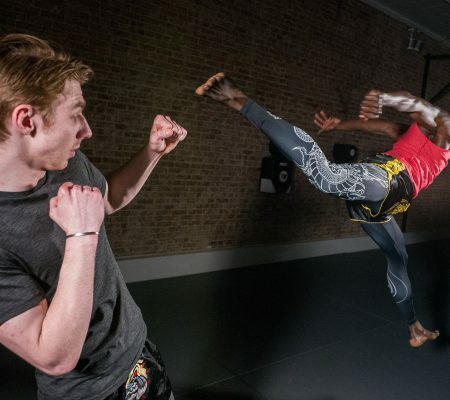 Once you step on the training floor and join AMAA you will begin to understand that Martial Arts training at Anderson’s Martial Arts Academy is a level beyond anything you have experienced. It’s training without limits, fueled by the power of a mind-body-spirit transformation and the promise of infinite potential, ability and security. It’s your mind made more reactive, your body stronger, your choices calculated, and your life lived better. It’s the feeling of security and confidence. It’s self-knowledge, and it’s the ability to act and react to any situation when you need it most. Anderson’s Martial Arts’ students know that productivity doesn’t end with the workday, the workout or the class. AMAA training pushes past the walls of the Academy, past the gym and straight into every part of your life. At Anderson’s martial Arts Academy your goals will grow with your accomplishments. Our teachers, classes, curriculum, workshops and seminars will get you there every step of the way. There is nothing else like it, anywhere. And the only way to find out is to Schedule Your Free 3 Day Trial here, or Start Your Training Today. You will begin with Phase 1 Jeet Kune Do / Inosanto Kali classes, as well as Muay Thai, Boxing, Gracie Jiujitsu and Knife education. 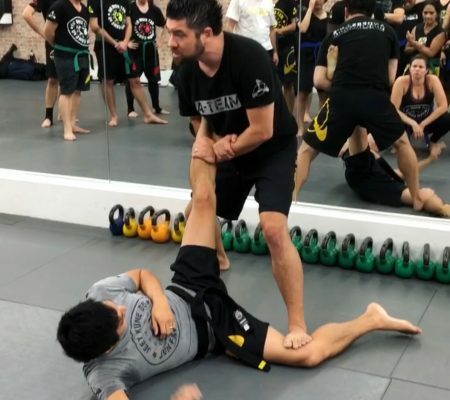 Jeet Kune Do will be your parent art, and the other arts an extension of a deeper education in each area; ground fighting (Gracie JiuJitsu), the most effective striking arts in the world (Boxing, Muay Thai and JKD), the most efficient and lethal weapons system (Filipino Martial Arts/ Inosanto Kali/ Silat). AMAA’s program has a uniquely holistic approach to high-performance living in every sense of the world; from ability, mental and physical development, self discovery, discipline and the development of reaction, timing, and the ability to feel energy – your results will be inevitable and vast. You will reach an elite state of body awareness, fitness, health, self defense ability and self discovery. The result? When you change your behavior and also identify your goals, you begin to function at a higher level across the board. Whatever it is you do, Anderson’s Martial Arts Academy will help you do it at the peak of your powers. You’ll think, respond, and move like a champion, every single day. We’ve all got our reasons for training. And if you train correctly those reasons will evolve and progress into new goals. 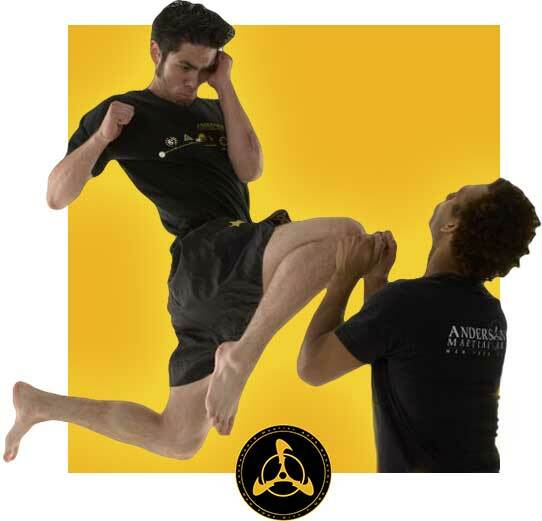 At AMAA, we have a systematic approach to helping you achieve totality in your martial arts. Getting to blackbelt level, ability and beyond. Because no two bodies are the same, there is always an individualized part to your curriculum and training. Your Jeet Kune Do will evolve into a fluid understanding of all areas of self defense, combat and art. Your first step is the Anderson’s Martial Arts Free 3 Day Trial, which includes an in-depth dive into all of our classes and curriculum. You can take Jeet Kune Do and Kali class, Muay Thai, Gracie JiuJitsu, Boxing, and knife classes. Your instructors and our program will evaluate your goals and objectives to help create a training schedule made for your life. Since needs, goals and lives change, the AMAA schedule is always flexible, and students of all levels can come to every class from day one, except Jeet Kune Do/ Kali Phase 2/3. The goals? Performing at your peak, feeling secure, confident, disciplined, having the ability to defend yourself and your loved ones is crucial — it is the key to living your life with a peaceful state of mind. A martial arts Academy is not a gym, but a place of higher learning and physical as well as mental development. Your progress is only as good as the people behind it. With Anderson’s Martial Arts Academy, you will have the very best, most accredited and decorated, knowledgable instructors on your side. We aren’t trainers, or coaches, we are martial artists (with full lineage and education) and we are educators. Anderson’s Martial Arts Academy founder Sifu Dan Anderson is well-known and highly respected for setting the standard in his field. With over two decades in martial arts, his accolades, achievements, teaching and lineage speak for itself.